The architectural framework for what we consider quintessentially Parisian style is largely due to the work of Baron Georges-Eugène Haussmann. Haussmann lived between the years of 1809 and 1891 and is perhaps best known for the work he did as Prefect of the Seine Department in France. In 1853 he was chosen by Emperor Napoleon III to carry out a massive public works programme in Paris. The renovation included the building of wide avenues, new apartment buildings, parks and squares. It also included the annexation of the suburbs surrounding Paris, and the construction of new fountains and aqueducts. He led the programme from 1853 – 1870 and even after he was dismissed (he was accused of extravagance) work continued on his renovation projects until 1927. The street plan and distinctive layout of the center of Paris today is largely the result of Haussmann’s renovation. Haussmann’s influence was not confined to building exteriors. New residential five floor apartment buildings were constructed as part of his renovation. Each had perfect alignment and symmetry with the next. He created a template for apartment interiors that established high ceilings, parquet flooring, white walls, floor-length windows and intricate wood and plasterwork as the acceptable standard. 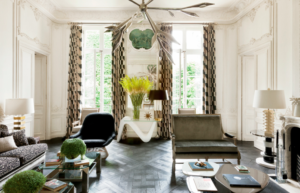 Changing the height of your ceiling and recreating ornate plaster work might not be practical in your home but installing a parquet floor would be a good first step towards recreating an interior inspired by Parisian style. The most successful Parisian interiors manage to blend classic pieces such as Louis chairs with modern furniture and art creating wonderful contrasts. Fortunately Paris has lots of flea markets brocantes where you can search for unique items to add to your apartment. If a trip to Paris is not possible for you personally search for unique items and curiosities online and in suitable local retail outlets. Your aim is to create a multi-layered and unique interior against a backdrop of white walls. Accessories are vitally important. The Parisian style is Bohemian rather than overly sanitised or curated. Essential items to purchase will include crystal chandeliers, feature lighting, gilded mirrors and rugs. Use luxurious fabrics and finishes in bold colours to complete your Parisian influenced apartment or room. A mix of silks, velvets and fine quality linen are used in many Parisian apartments for curtains, cushion covers and throws. Marble mantle-pieces are decorated with unique artefacts and bric-a-brac. If this article has inspired you to add a Parisian feel to your home I would love you to share your photos with me. Alternatively, if you would like me to help you with your project don’t hesitate to reach out!